At the Campinski 2006 an autonomous, feminist WomenLesbianTrans-Meeting against G8 was established as a network of different groups in Germany. For mobilising and information purposes we are finally online with our own website on the platform of the dissent-archive.ucrony.net/dissentnetwork/-page. Camps: We´ll have a WomenLesbianTransgender-Space in the camp in Reddelich (close to Heiligendamm), next to the queers and NoLager-activists. The construction of the camps starts a week before. In the WomenLesbianTransgender-Space there will be also a small just WomenLesbian corner. We ask you to give a solidarity-donation for the camp wich should be around 5 Euros a day. On the camp there will be an infrastructure from kitchen to toilets. Informations about how to come to the camps can be found on the dissent!-main-page. International Demonstration, Sa., 2.June, Rostock: There will be an WomenLesbianTransgender-Block on the international Demonstration in Rostock. We will go close to the FeministMeeting- and the NoLager-Block. We invite all of you to come and to participate in our Block. Days of action, 3.-7. June: There will be different actions prepared by our Network and others on the following days of protest wich we invite you to join! We hope to see you at Rostock, Reddelich and around! Feminist greetings, the WomenLesbianTransgender-Network. 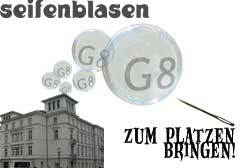 Come to the feminist women/lesbian/trans resistance against the G8 summit. Auf dem Campinski 2006 hat sich eine eigenständige, feministische FrauenLesbenTransgender-Vernetzung gegründet, der deutschlandweit verschiedene Gruppen angehören. Eine eigene Internetpräsenz dazu im Rahmen des dissentnetzwerk.org mit eigenem Positionspapier ist online. Groß-Demo 2. Juni: Auf der internationalen Großdemonstration wird es einen FrauenLesbenTransgender-Block geben! Wir starten am Bahnhof Rostock und laufen in der Nähe von Feminist Meeting und NoLager. Sternmarsch: Wenn eine sinnvolle Route noch erlaubt wird, laufen wir auf einem Arm unter dem Motto: "Reclaim feminism"
Aktionen: Mehrere kleine Aktionen z.T. zum Mitmachen werden vor Ort bekannt gegeben. Eine interessante Linkliste zu feministischer Ökonomie, Globalisierung und Geschlecht findet ihr unter 'Diskussion'. Diese Seite wurde zuletzt geändert um 16:35, 21. Mai 2007. Diese Seite wurde bisher 9.036 mal abgerufen.